"Bigger, scarier, cooler..." intones Dr. Henry Wu (B.D. Wong) and for the most part Jurassic World with its Indominus Rex, a T-Rex hybrid, matches that expectation with surprising aplomb. It's the best Jurassic Park movie since the iconic original graced cinema screens 22 years ago. Whereas Jurassic Park director Steven Spielberg's first sequel The Lost World: Jurassic Park floundered as King Kong remade with a T-Rex and Jurassic Park III was a fun reprise of the original, but did nothing to push the franchise further. Director Colin Trevorrow's Jurassic World, executive produced by Spielberg, delivers the realisation of John Hammond's dream: a working theme park populated with dino attractions, IMAX 3D theatre and Starbucks, yes, Starbucks. This is the sequel franchise fans have waited for. I've been a self-confessed Steven Spielberg fan since childhood and the opening title sequence, replete with the mythological Amblin logo underscored by Michael Giacchino's lush orchestrations reprising John Williams' Jurassic Park theme, brushed away any last minute cynicism I may have had following the lukewarm trailers. It also presciently grabbed the attention of cinemagoers staring into their smartphones. The first act is a surprising and clever deconstruction of the Hollywood blockbuster and capitalism, as the scene is set in a bustling, sunkissed, theme park filled with jaded, affluent, visitors from around the world. 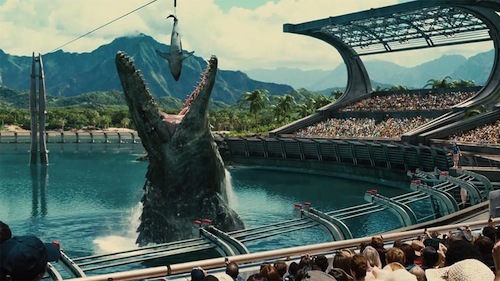 This is best illustrated when a Mosasaur surfaces to eat a shark (a knowing nod to Jaws) whilst many members of the audience, including a principal character, are mesmerised by their smartphones until the creature splashes back down forcing them to look up in wonder for the first time. Dinosaurs have dulled over the past 22 years and are in need of yearly upgrades in the era of generation selfie. Enter Claire Dearing (Bryce Dallas Howard) and her latest attraction Indominus Rex or iRex as I like to call it. Indominus exists to satiate investors by getting paying visitors through the gates. The audience laughed out loud at the suggestion of a 'Pepsisaurus' by resident geek Lowery (Jake Johnson). Inevitably, Indominus escapes her paddock prison and monster mayhem ensues with a little inspiration from Aliens, Gremlins 2 and Predator along the way. Things get stifled, but not derailed, by Hoskins (Vincent D’Onofrio). Brilliant as the complex Wilson Fisk in Marvel's Daredevil, here D'Onofrio's Ingen subplot to weaponise the dinosaurs detracts from the absurd chaos to be had. And Simon Masrani (Irrfan Khan) is an uneasy mashup of John Hammond and Dr. Ian Malcolm. Chris Pratt plays the archetypal B-movie hero, Owen Grady, with panache, but Claire's cliched transformation from ice maiden to action heroine isn't necessary as the mismatched couple searches for her missing nephews: cut-off and lost when an attraction is closed down and they fail to return. However, it's perhaps disingenuous to take too much issue with such a fun homage to Spielbergian adventures of yore, spearheaded by a likeable cast, which does serve as an anarchic satire with a healthy dose of horror. Joe Dante would approve.